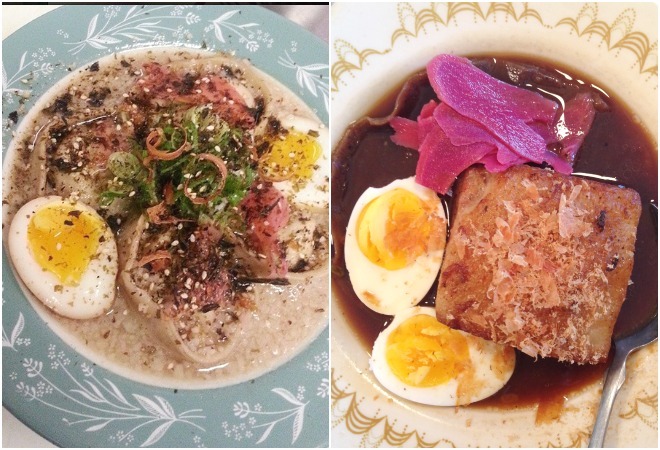 If you hadn’t noticed by now, Los Angeles really loves ramen. Like, a lot. Many popular ramen shops around town adhere pretty strictly to the traditional Japanese style, but once in a great while you’ll find someone taking on a more avant-garde approach. Well, one version we sampled recently was pretty magnificent: It began with a huge, plate-sized acorn flour raviolo, colored a nutty brown, filled with piping-hot reduced pork broth (“it’s basically like a giant soup dumpling,” says Wilson, who makes the pasta himself). A ladle of umami-rich broth, darkened with a bit of soy sauce, is poured over the top and the bowl crowned with a tender square of Cook’s Ranch pork belly chashu, a dusting of shaved bonito, and an oozing marinated, soft-boiled egg. Thin slices of house-pickled red ginger help cut the fattiness. “I like to keep the toppings pretty traditional,” admits Wilson. On another day, the raviolo has been swapped out for smaller broth-filled tortelli and the soup has been thickened with extra garlic and kotteri (pork back fat) to give it an almost milky appearance. A shower of chopped scallions and furikake join the marinated egg and pickled ginger. Another day, the noodles are thin and straight, the brother lighter, and a sheet of dried nori is floating on top. The experimentation continues. We gladly look forward to more tinkering. As any Japanese chef will tell you, ramen requires no shortage of labor. Thankfully, the kitchen at Sqirl seems to have boundless energy when it comes to brainstorming new and exciting dishes. Follow either @riadolly4 or @sqirl_confitures on Instagram to keep updated on the café’s daily specials (caution: it was also make you very hungry).